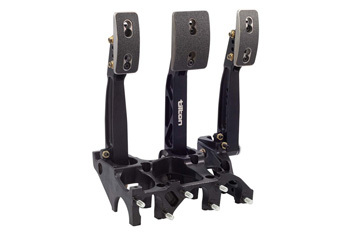 Forged aluminum pedals and an aluminum frame give the 600-Series underfoot pedal assembly rigid and lightweight support for even the most grueling applications. Included with the assembly is a large 7/16”-20 balance bar (600-Series Balance Bar Assembly), which minimizes flex and provides a solid pedal feel. Action on the pedals is kept smooth and consistent with low friction oil-impregnated bushings on the pedal pivots. For additional customization, the 600-Series 3-pedal underfoot assembly is also compatible with customer-supplied false floors and heel rests. The optional Tilton throttle linkage kits are designed for use with either mechanical or drive-by-wire throttle systems.